Twitch is going to stream more than 500 episodes of Doctor Who in its latest Twitchpresents. So, if you have never seen Doctor Who before, and want to know what the fuss is all about, now’s your chance to catch up. And we literally mean catch up. Doctor Who is a British science fiction show that has been running for more than 50 years. During that time, it went off air for 16 years before the BBC rebooted it in 2005. And now, Twitch is streaming the 500+ episodes that came before that. 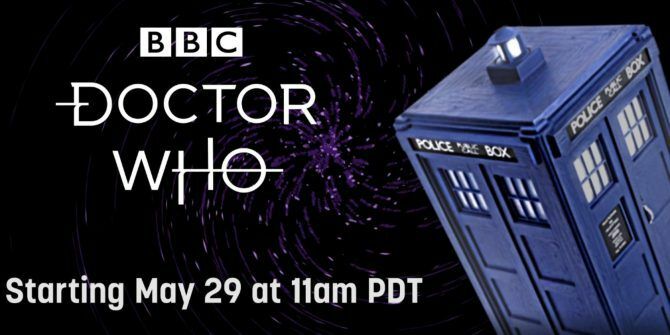 The Doctor Who marathon on Twitch kicks off on May 29. New episodes will be streamed for eight hours every day starting at 11am PDT. Then those same episodes will be repeated twice more, filling the 24-hour schedule. After seven weeks, seven Doctors, 26 seasons, and more than 500 episodes, Twitch’s Doctor Who marathon will end on July 23. By which time you’ll know the origins of the Daleks, the Cybermen, the Sonic Screwdriver, and a lot more besides. Think 26 seasons of Doctor Who on Twitch is a lot? Like the TARDIS, this marathon is much bigger on the inside. This marathon covers the original run of Doctor Who from 1963 to 1989, so there will be no Christopher Eccleston, David Tennant, Matt Smith or Peter Capaldi. Instead, you’ll have Jon Pertwee, Tom Baker, Peter Davison, and Colin Baker. Twitch also has exclusive Doctor Who emotes for subscribers, a seven-part Yogscast introducing each new Doctor, and prizes for anyone who watches, including a trip to London Comic Con. The Doctor Who website has a full schedule for the Twitch marathon. If you have never seen the old episodes of Doctor Who, then prepare yourself. As television has moved on somewhat since these were first broadcast. Think Star Trek: The Original Series, but with even dodgier special effects and more bizarre stories. Still, included in the Twitch marathon are some of the best Doctor Who episodes of all time Who Is Online: The Best Doctor Who Episodes of All Time Who Is Online: The Best Doctor Who Episodes of All Time If you want to get into Doctor Who, and enjoy the most important episodes of this British institution's entire televised history, start with the list we have lovingly prepared for you. Read More , so it’s worth looking past the obvious flaws. And when the Twitch marathon ends you can always listen to the best Doctor Who podcasts for Whovians The Best Doctor Who Podcasts All Fans Need to Hear The Best Doctor Who Podcasts All Fans Need to Hear If you're looking to get your regular fix of Whovian news and opinion, here are some of the best Doctor Who podcasts to help you pass the timey-wimey between episodes. Read More . Explore more about: Doctor Who, Twitch.